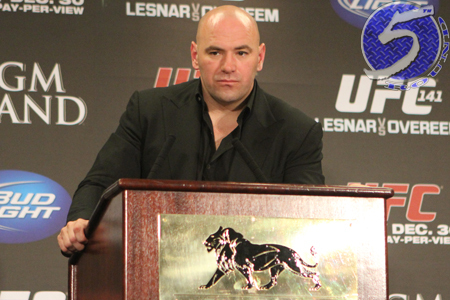 It’s fight week, so you know what that means – it is also blog week for UFC president Dana White (Pictured). In his latest installment, White provides exclusive behind-the-scenes footage from UFC 141 as we head into this weekend’s pay-per-view broadcast in Brazil. There are several interesting clips in this edition, including White telling Nate Diaz to “be cool” following his win over Donald Cerrone. White also appeared a bit relieved when the bitter rivals hugged after their epic battle in the cage. Fans are also provided with the final images of Brock Lesnar entering and exiting the Octagon. The former UFC heavyweight champion retired after his loss to Alistair Overeem in the night’s featured attraction. UFC 142 takes place Saturday inside the HSBC Arena in Rio de Jenairo. The pay-per-view broadcast airs live in North America at 10PM ET/7PM PT.